This is our toddler class for ages 18-30 months with space for 12 toddlers. 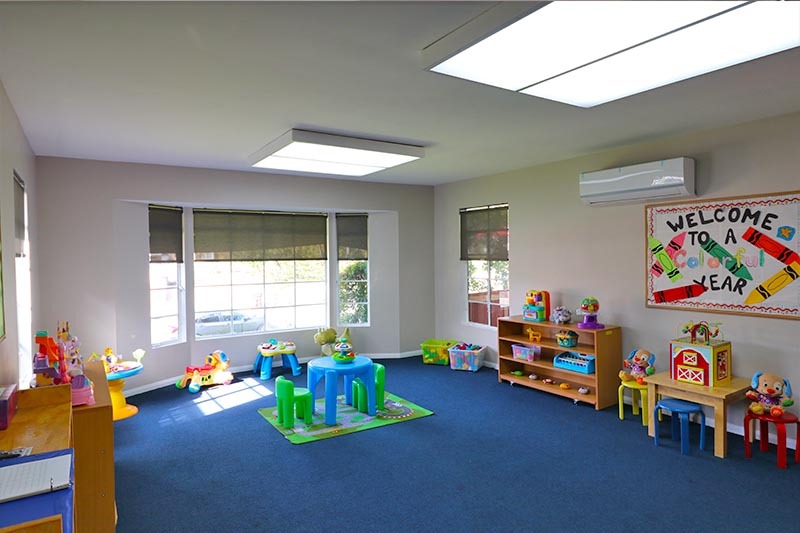 The carpeted classroom is setup with plenty of open space to practice safe walking, explore age appropropriate toys and books and has individual cots for nap time. Our toddler curriculum creates a developmentally appropriate learning environment that empowers toddlers to be confident, successful, lifelong learners. Language is starting to blossom as toddlers expand their vocabulary from single into multiple-word phrases. Our teachers continually model language and engage toddlers in rich conversations. By providing a language-rich environment that encourages your child’s progress towards achievement of two-way communication, your toddler will have the opportunity to participate in conversations with teachers and peers, follow one-step directions, develop an appreciation of books through stories and read alouds, increase short-term memory and recall, use writing tools and make purposeful marks such as scribbles on paper. A toddler classroom is full of math activities from figures for sorting, to shape boxes for matching, to cups to stack by size, to sensory tables to learn comparison of quantity and volume. With our toddler curriculum, teachers help one and two-year-olds take their first steps towards understanding math by using "number talk" such as more/less, under / over, inside / outside, full / empty, counting to two or three during activities such as snack time, talking about time in daily conversations ("Now…then…last") and playing sorting and matching games. Toddlers have a strong sense of curiosity about how things work and an innate desire to make sense of the world. From stomping in puddles to investigating a sandbox, our curriculum nurtures and builds on these natural instincts, offering toddler’s meaningful learning experiences that continually foster and develop their scientific thinking and skills. Our teachers weave scientific learning into all aspects of a toddler’s day by offering opportunities to explore multiple solutions during story times, play with puzzles and busy boxes, manipulate playdough with tools such as cookie cutters and rolling pins, experiment with volume through sand, water, and rice play at the sensory table and formulate "why, what, how?" questions in daily interactions. Meaningful engagement in the arts allows toddlers to think flexibly, generate creative solutions, and enhances development in other areas including literacy, math, and science. Our teachers encourage creativity and innovation by engaging children in artistic experiences that allow them to explore art with all their senses. Your toddler will have the opportunity to explore sensory materials - squishy clay, textured sponges, and scented paint, experiment with and explore colors, play, dance to varied types of music, participate in pretend play and play with puppets. Daily activities such as watering flowers, viewing diverse family photos, and playing with differently-abled figurines help toddlers begin to step outside their own boundaries and to embrace concepts such as acceptance, diversity, and personal responsibility. Toddler teachers encourage children to reflect on themselves, their peers, and the world they live in by talking about feelings, having "show and tell" times, encouraging play between peers, expressing compassion and empathy in books and daily interactions, connecting actions (i.e., taking a friend's toy) to an effect (crying from the friend). The relationship between a child's physical health and his social, emotional, and cognitive achievements makes it crucial to ensure he feels strong, healthy, and well-nourished every day. Well Aware focuses on child nutrition, safety, and wellness, and lays the groundwork for a lifetime of healthy habits. Our toddler teachers enable children to understand how their bodies work, what they need, and how to protect them by helping children practice small muscle skills like drawing, writing, cutting, spend time in the natural world, identify healthy foods and growing vegetables from seed, practice proper hygiene and follow safety rules.